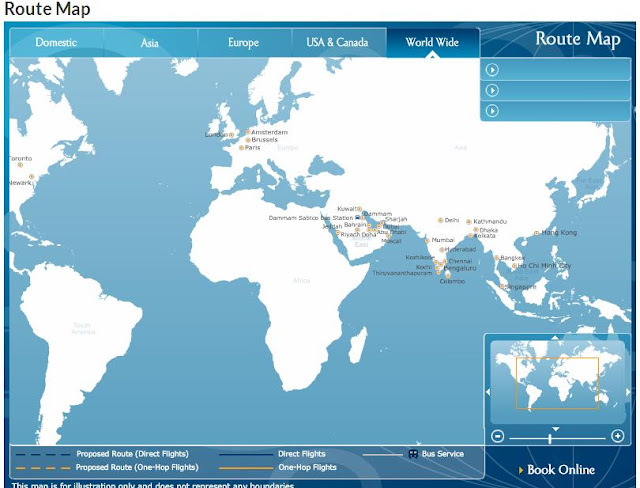 Welcome to my 85th airline trip report! Aircraft photos are credited to the respective photographers from Airliners.net. 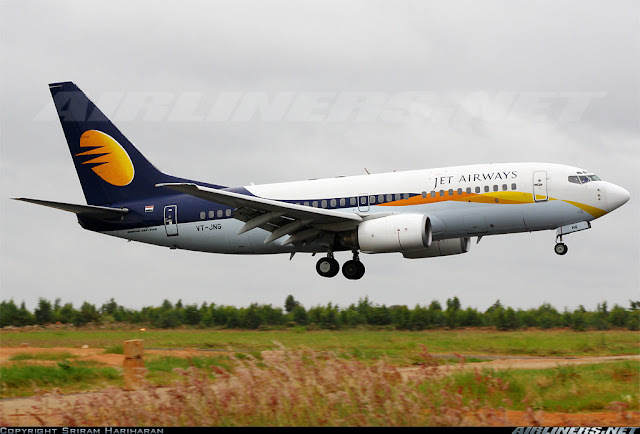 I had no idea that Jet Airways was flying on this route until I discovered it during my joyride January 2016 trip and I knew that I had to fly with this carrier. The decision to fly with this airline was an easy one but the question was should I fly this airline both ways (BKK-SGN-BKK) as the air ticket was cheap (U.S$100 for return). After doing some research, I decided to fly to a new city instead and Manila came into my mind. I checked the fares of Philippines Airlines and Cebu Pacific and decided to fly to Manila from Ho Chi Minh City with Philippines Airlines and from there I fly home with Cebu Pacific. Besides I could visit a friend in Manila and also check out the airports there too. I knew I had to visit Philippines one day and why not this time? 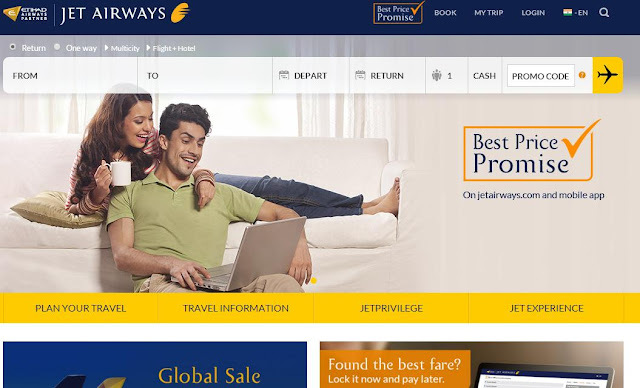 Once I made up my mind, I did my separate bookings and so its one way trip on Jet Airways. Every minute on board this flight matters since I have no idea when would the next time I fly with this carrier. Jet Airways is the 2nd biggest carrier in India, based in Mumbai. It was initially started out as an air taxi in 1992. 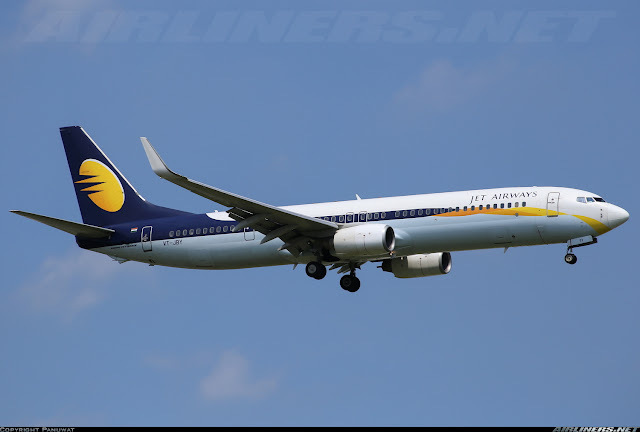 Commercial service was started a year later with a leased of 4 Boeing 737-300s from Malaysia Airlines. In 1995, the airline was given the right to operate scheduled flights and its strategy was to compete against Indian Airlines (which has been absorbed by Air India). The airline expanded and made some decent profits and that allowed it to purchase Air Sahara in 2007 and this former airline was renamed to Jetlite to market it between Low Cost and Full Cost carrier. However, in 2008, Jetlite was integrated to Jet Airways causing 1,900 people to lose their jobs. 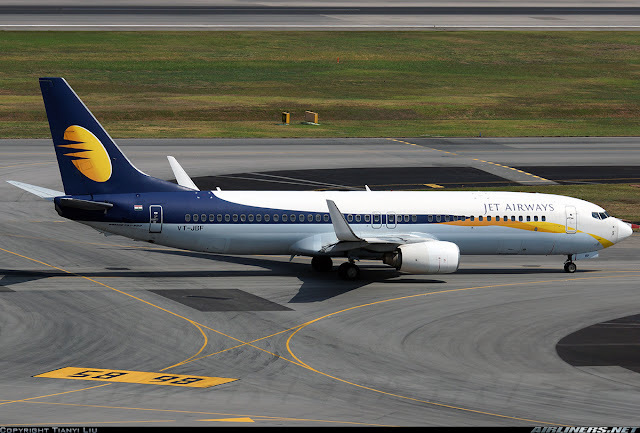 The good news for those who lost their jobs, they were re-employed and joined a newly created subsidiary at that time - Jet Konnect. 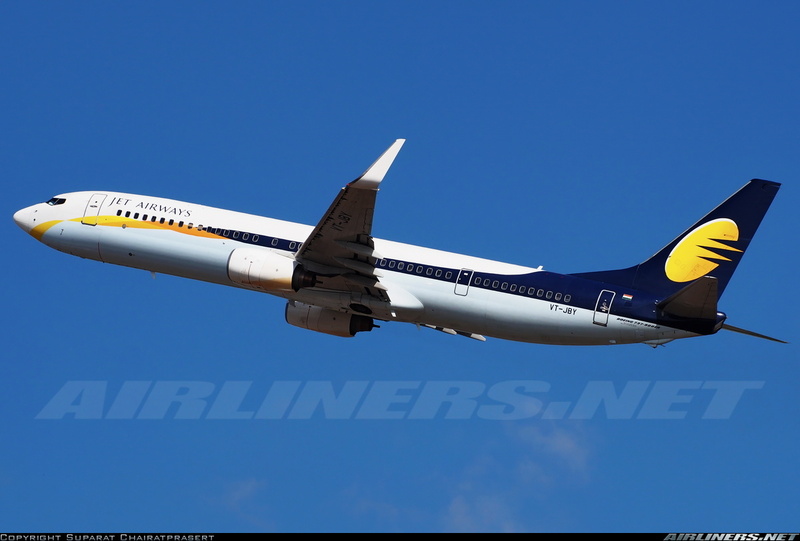 In 2014, this branding was also phrased out and merged into Jet Airways and for now, this airline is doing not too bad after a recent cutting cost of aircraft and routes. 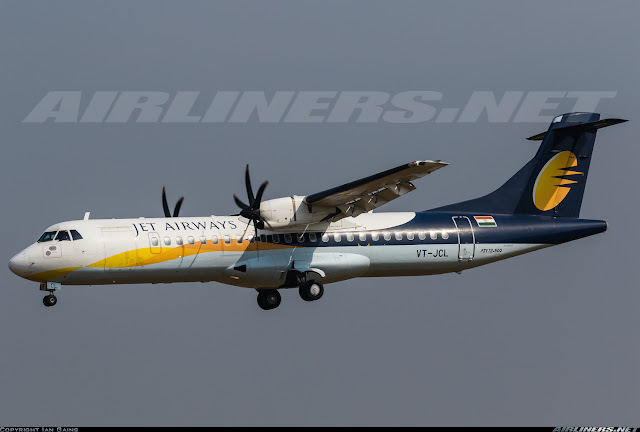 It currently operates a fleet of ATR-72-500, Boeing 737-700/-800/-900/-900ER, Airbus A330-200/-300 and Boeing 777-300ER. The website is easy to use, no issue with it on Chrome browser. I got my booking done within minutes. For a short flight like this, I go for the cheapest fare. A timer to keep check to ensure you complete your booking before the timing ends. 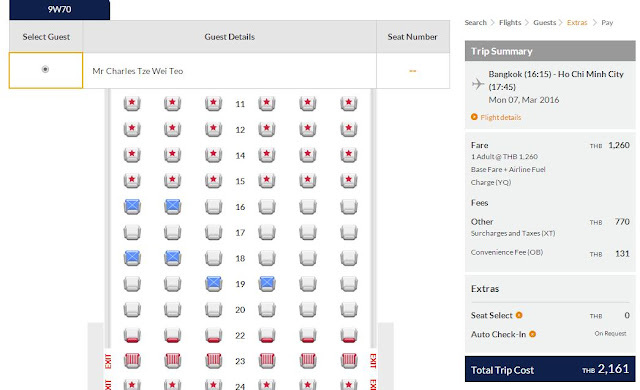 There is pretty fair I feel especially for those can't decide and want to take advantage of the lower fare. I thought this would be a pretty empty flight, but I was wrong! More of that on the later part of the trip report. Within seconds, my booking was completed. I stored my itinerary on the application. 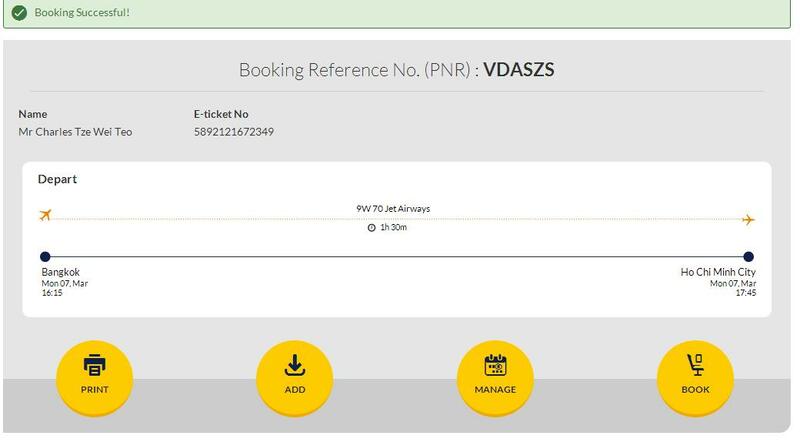 If only there is an option to directly check-in without the need of copying the 6 digit PNR to do so. I suppose you have to be a member in order to check in without this inconvenience. My initial seat was 36A, I should have stick to it. Later on, I changed it to 35F. The process is easy, so one shouldn't have much problems with it. 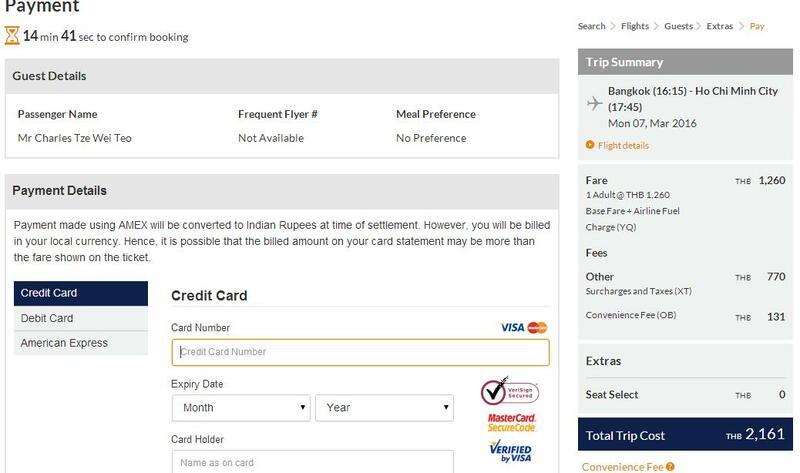 Air India's website is also as efficient as this. Staying at Phoenix Hotel this time allowed me to relax and enjoy some nice breakfast at a nearby restaurant and enjoy some plane spotting at the hotel's rooftop. 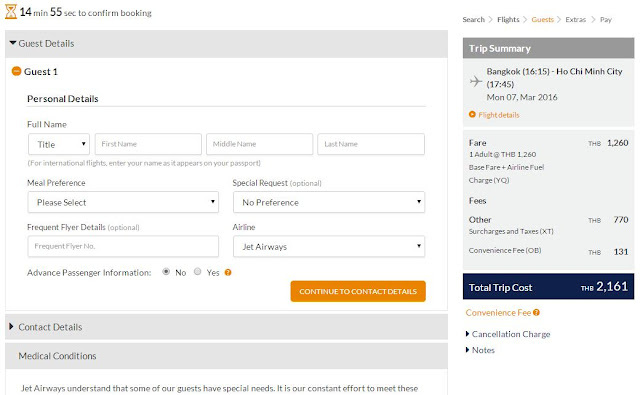 It is my preference over the other hotels especially if I have a flight near BKK airport to catch. The following morning, I went to this popular restaurant to enjoy my breakfast. Checking what's my ride, VT-JBY would be taking me to Ho Chi Minh City. I reached the airport around 1215 and I had a few hours to spare. I hope to add Austrian and Juneyao Airlines to my list in the near future. Not knowing there is already a queue forming up for my flight, I waited at a seat thinking that my flight would probably be empty, boy I was so wrong when I got to the queue, the line was long! There was a queue for another flight. A few of the passengers at my side realized that the counters on this side was only to Ho Chi Minh City and they had to queue up again at the other one - their faces said it all. It took me around half an hour before getting my boarding pass. No separate queue for web check-in passengers. The check-in staff asked me the usual questions and my onward journey. Once those questions were answered and she was satisfied, I got my boarding pass and luggage checked in. 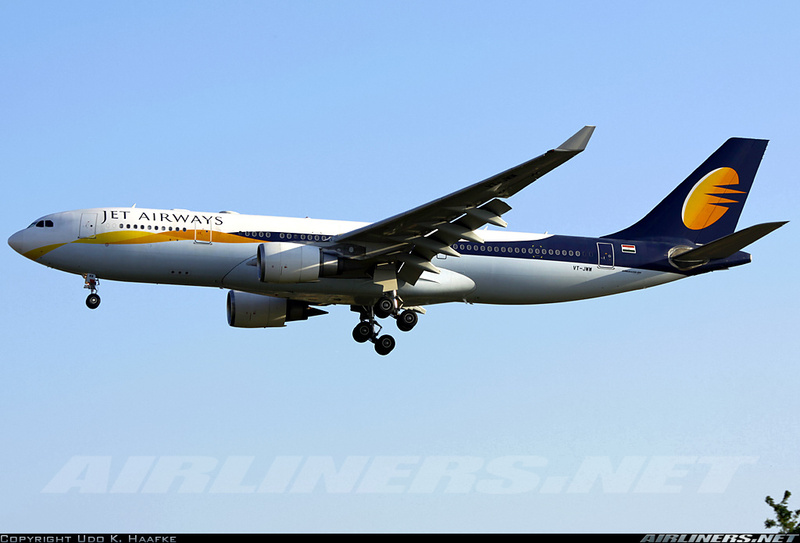 New airline for my flight logbook. Once I was done, I made my way to the air side to grab some lunch. On my previous trip to Ho Chi Minh City from Bangkok, I flew on Jetstar Pacific, you can check out the trip report over here. Look at the number of flights! Lunch at Silom Village - I find this better than the others. After that I made my way to the assigned gate. Photography for aircraft is almost impossible. The aircraft had already arrived and another round of security check, this time done by the airport staff. My ride had arrived from Mumbai. You can relax for a while near the gate area. Airport looks very dull at this part of the building. Boarding started pretty early and there were already passengers on board standing around and stretching their legs. They were from the previous flight, Mumbai to Ho Chi Minh sector. Load factor was almost full, and that made me wonder why did the airline decide to withdraw the Bangkok to Ho Chi Minh City sector. On board, I was greeted by the middle aged crew. Not all of them were friendly as I made my way past them towards my seat. It turned out to be a full flight with a good number of Vietnamese heading home. Only thing I could guess is probably the low yield - not profitable for the airline, hence the decision to end the route. Here are some photos of the cabin. Comfortable looking 2-2 configured J class seats on the 737-900ER. No In-flight Entertainment system in both Business Class and Economy Class cabin. Wifi is also not available, so if you fly on this aircraft type, remember to bring along your tablet if you need entertainment. Bulkhead row usually has more legroom space than the other rows. I find the colours of the seats quite matching and trying the seat itself, it is quite comfy. Only thing is the seat pitch, a bit tight for me. I would definitely recommend the emergency row or the window seat in front of the emergency row. Of course you have to pay for those seats. Most of the passengers you see in the photo below were on the previous flight from Mumbai. The view from my seat. The seat in front of me, gets better legroom space but you face the crew during take off and landing, so choose seat 34A for legroom space and privacy. Just the audio entertainment, no In-flight television in the Economy Class. As you can see there is better legroom space over here than the others. The old 737 style cabin, not a surprise since this is a 9 years old aircraft. Audio Entertainment system - not a fan of it. My seat mate went to the toilet and my left leg got to stretch out a bit. Greeted by the Indian crew who probably stayed over in Bangkok for a day and did the return Bangkok - Ho Chi Minh City sector before resting at Bangkok for a day then fly home to Mumbai. There were already passengers in the cabin as I walked towards my seat. Its a good thing I took some photos of the cabin early because later on, it turned out to be a full flight. A couple of Vietnamese guys were my seat mates and they were returning home. They spoke no English but I allowed them to take some photos when they asked me (hand signal). Announcement was made in both English and Hindi. 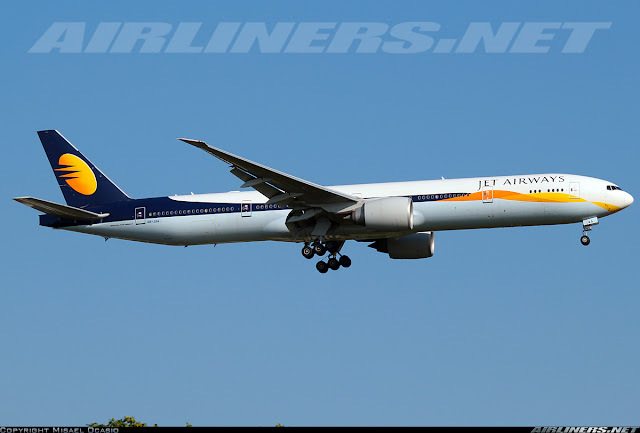 At that time, there was also another Jet Airways flight bound for New Delhi so passengers had to make sure they arrive at the right gate. This set of crew reminded me of my Xiamen Air's flights on the 737s. They weren't opened towards the passengers initially (I feel) but just did what they had to do and get it done and over with, at least they were not rude. As the time passed by, their mood improved especially after the meal service. I have to give them credit as they did the meal service fast and efficient. 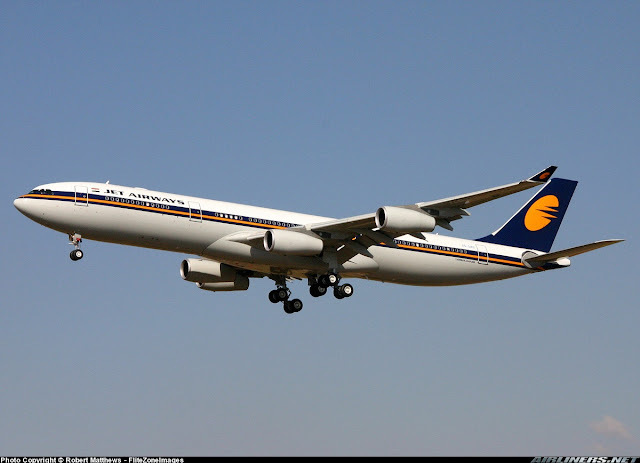 For a short flight like this and to handle over 200 passengers on this narrow-body, is a challenge. Fortunately the weather was good for most parts of it, just slight bumps midway through the flight as predicted by the flight crew and on arrival, it was surprisingly smooth. The flight crew were great as they kept us updated through out the flight and it was good to know that we arrived ahead of schedule and it was a nice touch for the First Officer to thank the cabin crew for their hard work. I saw a wide smile from the cabin crew sitting at her station. 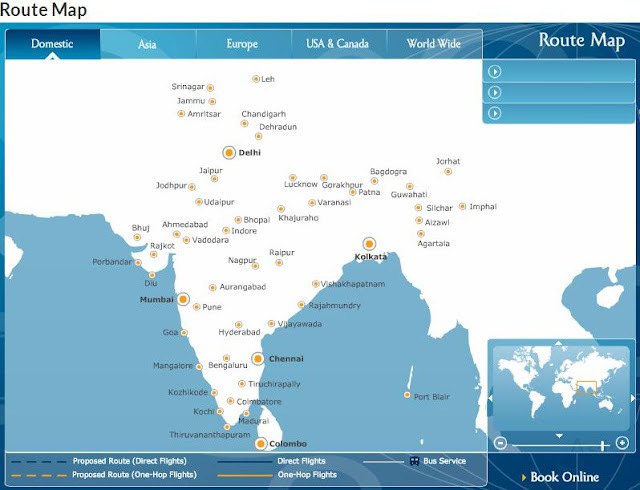 Overall, I enjoyed the flight and would I fly with this airline to India? Yes, definitely if the price is right and hopefully on the Airbus A330 or Boeing 777-300ER. A choice of beer or water - first time for me, its usually either soft/drinks or water. Looking forward to this hot meal! This was the only choice for this flight, not complaining since other airlines flying on this same route offers only a light snack. Nice to see metal utensils being used. I was satisfied with the noodles and dessert, I felt full after enjoying this light dinner. We parked beside fellow company's Boeing 737-800 bound for New Delhi. That aircraft was gone when we pushed back and Qantas Airbus A330-300 was also getting ready to depart. We pushed back all the way to the active taxiway. Once our engines were started and clearance was given, we taxied to the active runway, 19 Right for departure. A retired Thai Airways' aircraft was spotted. Interesting airlines for me - Ukraine International and UTair. Entering the "piano's keyboard" means we were at the runway. Rolling down the runway. As the light was against me, I decided to not to take video of the take off. Take off was slightly bumpy with some gust wind causing our aircraft to shake quite a bit while we were heading towards our assigned Flight Level. Soon, we cleared the clouds and headed towards the direction of Ho Chi Minh City. Passing by some high clouds, good thing we don't have to fly through them. It was a pleasant day for flying. At this point, I was enjoying my meal. Soon, we started our descend. Making a couple of turns to get ourselves lined up for the runway. Landing at SGN airport was surprisingly smooth, it's usually slightly bumpy whenever I arrive here. 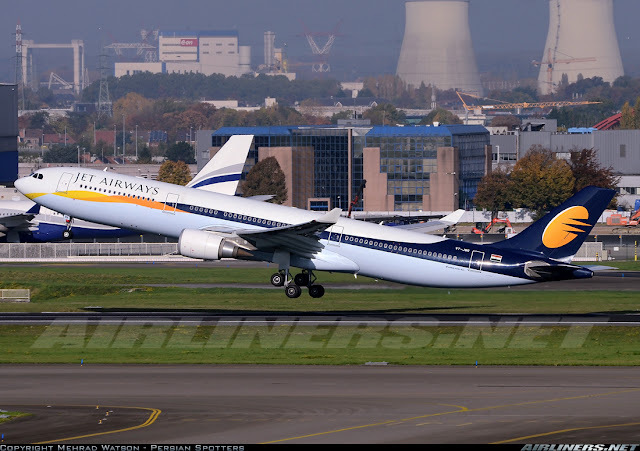 Now you know why window seat is important for aviation enthusiasts? Pity the window is dirty. Touched down safely on runway 07R. Just in time to enjoy the sunset! Didn't see any Vietnam's A350 and Boeing 787 aircraft. Finally came to a stop and we disembarked the aircraft via the aero-bridge connected to the terminal. You can check out my trip report on Air India over here. 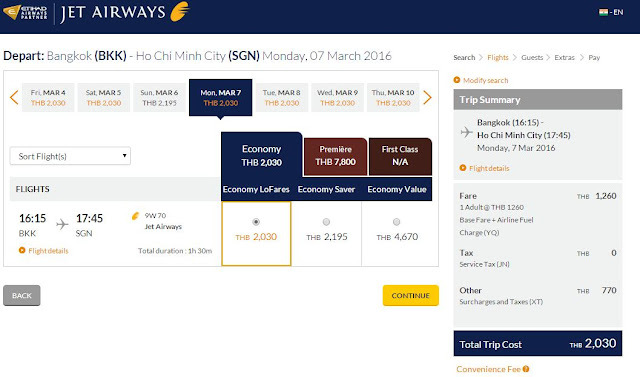 The airline will stop flying Bangkok-Ho Chi Minh City from the 26th March, the reason as mentioned earlier is not known. I am glad to be able to sample this airline's product on the Boeing 737-900ER on this short hop without the need of flying to its home base. As far as I know, the airline has IFE system (Individual TV) on some Boeing 737-800, Airbus A330 and Boeing 777-300ER aircraft. 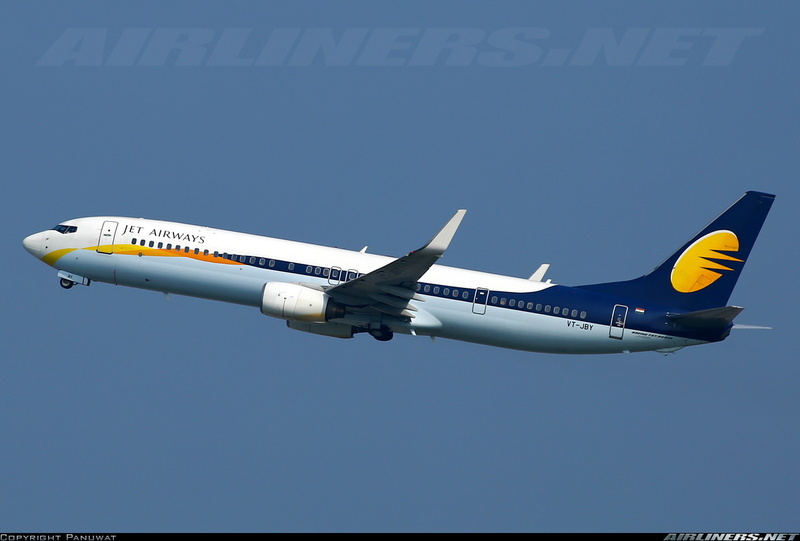 The Boeing 737-800s with IFE system usually fly on longer and more popular sectors but there is always a chance of one with the older cabin interior (without IFE system) flying on them as well, so it all goes down to one's luck. For the airline's J and Y class seats on my aircraft, I find it to be above average, just a pity the lack of IFE system. 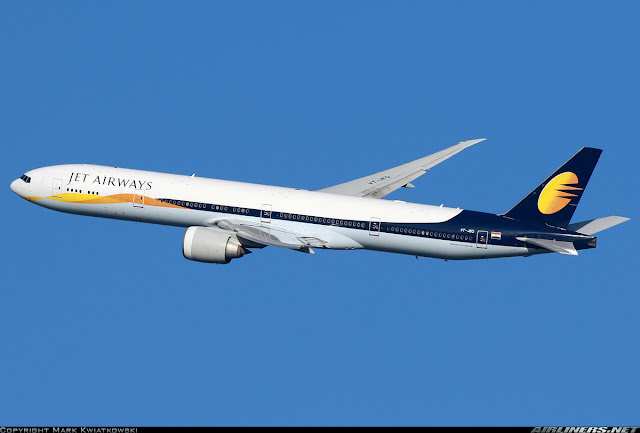 This airline is certainly a worthy competitor of Air India, but its competitor is already operating the Boeing 787 Dreamliner aircraft - a newer aircraft type. This airline has to wait until 2017/2018. Under the guidance of Etihad, this airline is certainly going places and for the airline to join an alliance seems unlikely now that it has partners from different alliance. 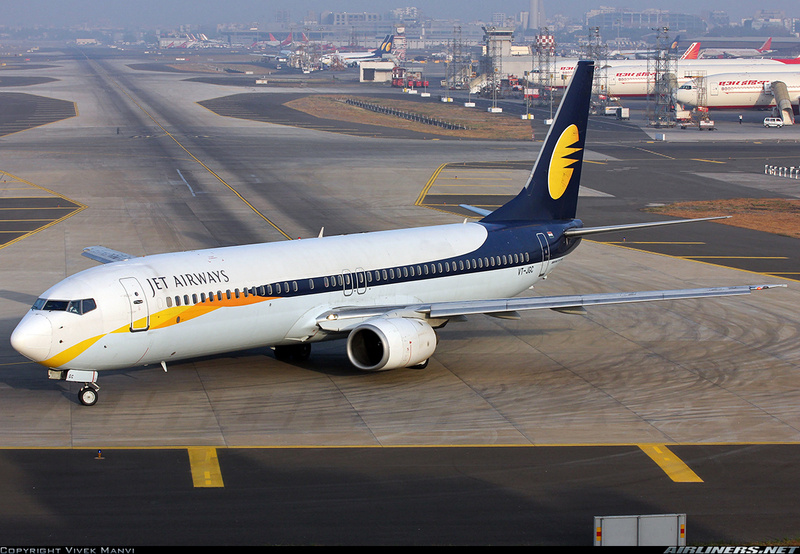 So in my opinion, if you have a chance to fly with this airline, go ahead! Safety record is good as far as I know.